Sidi presents The Sidi Crossfire 3, The 3rd Generation of the No1 Off Road Boot. Crossfire3 SRS is the evolution of the motocross boot which has won more awards than any other footwear in the off-road sector. To produce this remarkable item, the Sidi team made full use of all of its experience, professionalism and passion, combining research from the people who work in our laboratories with the feedback coming from our champions on the race tracks. The brand new Crossfire 3 is manufactured in "TehnoMicro" and it is equipped with PU protections. Both the tongue of the inner last with internal gusset and the back joints are padded with a closed-cell material, to avoid water and sweat absorption. The tip of the boot is entirely covered by plastic protection panels enriched by a geometric embossed design for more grip. 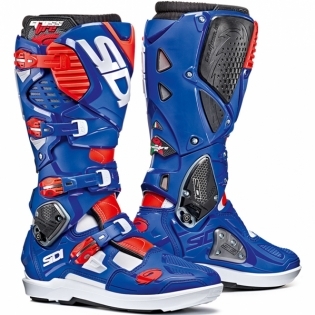 The Sidi Crossfire3 SRS represents the evolution of the Crossfire and Crossfire2 boot which in past years has managed to stand out at the most victorious and multi-titled footwear in the off-road sector, thanks to the extraordinary enterprises of Tony Cairoli and other Sidi champions. "SRS" stands for “Sole Replacement System” making it possible to replace the soles of these boots. Not only are the soles replaceable, but all other boot parts as well - all done with standard tools. The Crossfire 3 SRS system includes the brand new dovetail system and 4 screws for more safety. 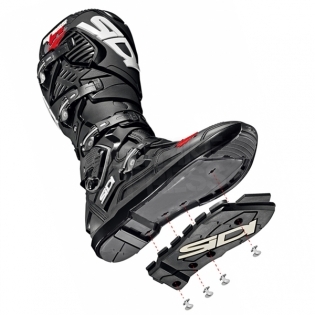 Sidi introduces the Hyper Extension Block System. In the heat of the action, the foot and ankle undergo extreme movement and trauma. This system has become fundamental in protecting the ankles and tendons of a rider. The Crossfire 3 is, as in the previous version, equipped with 2 joints: the first lower joint on the ankle, called “hyperextension block”, has a brand new technology. It prevents hyperextension of the ankle, of the instep and of the back tendon during front and back leg flexure. Such technology gives more safety to the rider. The second joint, placed on the bootleg, improves boot’s flexibility and the bootleg adjustment. In this way the rider can manage independently the calf’s closure subject to his needs, achieving a comfortable fit. On the back of the boot, between the two joints and the two wired air inlets, there is a graphical design made with PU insert. The bootleg has a replaceable inner calf plate, produced in PU and a printed rubber insert, to protect the leg from exhaust heat, wear and tear. The calf plate features an inner double adjustment, which allows to widen the circumference of the boot and accommodate even wider calves and shin guards. The front shin plate is anatomically shaped and replaceable. Crossfire 3 uses a 4 micro adjustable buckle closure, each with locking teeth and micrometric memory-regulation straps. Buckles, straps and retaining clips are easily replaceable. Buckles have just one fixing point (by a screw) and this allows an easy closure and the buckles to adapt to the rider’s position. 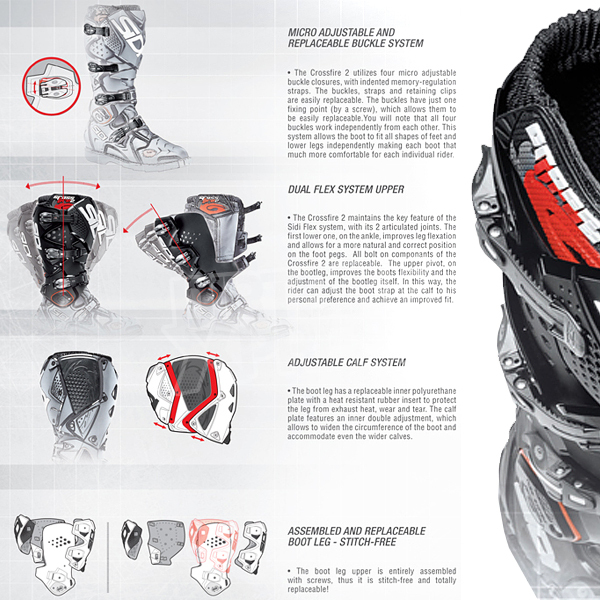 The main feature of the boot is that all four buckles work independently from each other. A spoiler has been added to deflect stones and other dirt from the first buckle, and to protect the buckle itself. The central strap system can be quickly replaced thanks to 2 screws that fix it to the boot, and it is available in 2 sizes (40-43) (44-50). Crossfire 3 is internally lined in Cambrelle (foot’s tip), while the ankle area up to middle calf is lined with a Teflon-treated air mesh. The Teflon treatment prevents the complete absorption of water and sweat. Effectively, not holding water on the inside, the boot will dry quickly and the treatment also prevents the onset of mould. Cambrelle is a lining that, due to its particular polyimide structure, is highly resistant to abrasion and provides a good humidity absorption, guaranteeing a rapid drying rate. The upper part of the inner leg is lined with soft mesh and features a special padding on the shin. The malleolus area is protected by an ergonomic closed cell foam memory padding. The upper ends with an elastic gaiter equipped with an anti-heat suede protection-grip panel, by the calf plate. The gaiter closes with a Velcro strap, with soft PU insert, to prevent the entrance of stones and dust into the boot. The bootleg is fully assembled with screws, stitch-free and entirely replaceable! The boot is equipped with a metatarsus protection. 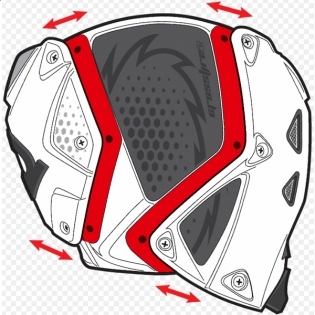 A rigid nylon insert has been added to protect the inner part of the boot in case the rider’s foot slides off the foot peg or the kick-starter. The insert is replaceable by unscrewing the 4 screws. The plastics of Crossfire 3, heel included, have all a new design. The anatomically shaped heel is manufactured in PU. Its particular shape has been studied and improved to provide foot’s safety in case of twisting. The new heel assures comfort and stability. The new interchangeable sole has an innovative design and a revolutionary replaceable system. Design and technology are Sidi patented. The shell, with a more aggressive look, is slightly higher for more grip. Tip and heel are fixed, while the central part, subject to wear and tear, is replaceable. The tip has a special pattern made of tiny grooves for more grip, perfect for Enduro too. The heel has a fixed soft PU insert which provides more stability and makes the boot less slippery. The central part of the sole is made with a rubber insert with a brand new dovetail system and 4 screws for more safety. Functional design for the speciality.